Despite his strong start, the Australian driver lost out on second place thanks to a free pitstop for the Mercedes pair under the Virtual Safety Car brought out when teammate Max Verstappen retired trackside halfway through the race. For Hamilton, it was a far easier afternoon. The Briton led the US Grand Prix from lights to flag, except for brief windows around the pit stops. Despite his strong performance, however, it was not a win Lewis was taking for granted. “I felt more comfortable at the start but I was worrying all the time. Reliability was the only thing on my mind,” said Hamilton, after the race. 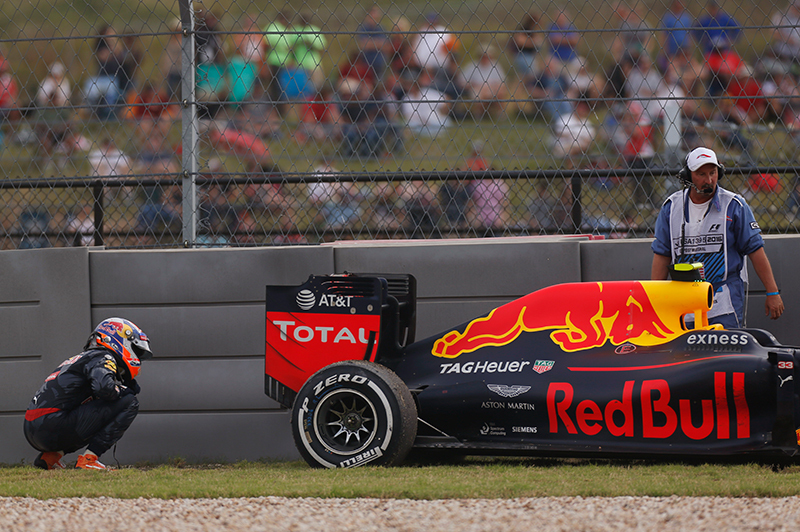 The US Grand Prix was a comedy of errors for Red Bull’s Max Verstappen, although it will probably be a few days before the Dutch racer can see the funny side of a Sunday afternoon that saw a strong performance scuppered by equipment failure. 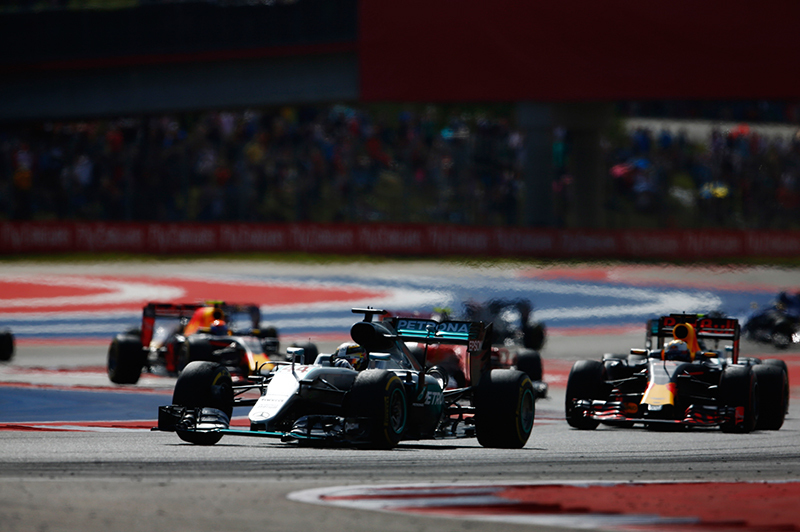 Having started on an aggressive strategy that saw the teenage racer make his first stop on lap 10, Verstappen had worked his way up from a post-stop ninth place to sixth by lap 12 and fourth by lap 18. Max dove into the pits at the end of lap 26 to discover that the Red Bull crew were completely unprepared for his arrival, as they hadn’t called him to box. The 9.2 seconds lost in the chaos that ensued while the team prepared themselves for their driver’s unscheduled arrival saw Verstappen emerge in seventh place, saying over the radio that “I thought you boxed me, sorry!”. Sorry though he might have been, minutes later Verstappen’s afternoon dawdled to an end when a gearbox failure saw the 19-year-old limping along the track for a very slow lap 29. He radioed the team to explain that “something is hitting the engine; the faster I drive the harder it hits”. Given that Verstappen was barely moving at that point, the team called their driver to stop in a gravel trap on the back straight, bringing out the Virtual Safety Car on lap 31. Pit stop problems didn’t end with Verstappen’s unexpected arrival. Another man whose race ended prematurely on Sunday afternoon was Ferrari’s Kimi Raikkonen. The Finnish racer had been on strong form all weekend – when the Scuderia’s relative lack of pace is taken into account. 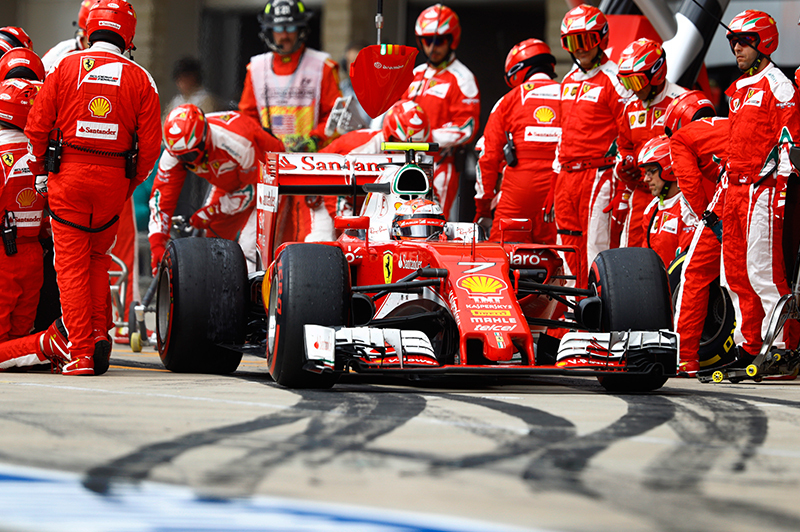 Kimi spent much of the US Grand Prix running in and around fifth place, ahead of his multi-titled teammate on track. By the time Raikkonen made his final stop of the day – shortly after the Virtual Safety Car period caused by Verstappen’s retirement had ended – he was running in fourth place. The fresh soft rubber he was given in the pits should have presented Kimi with the opportunity to give chase to the leading pack and possibly fight for a podium, but it was not to be. Raikkonen pulled away from his box before the right rear tyre had been properly fitted, causing the wheelman to tumble backwards as the car wrenched itself away from his still-active wheel gun. As the number 7 car was pulling up the hill to Turn 1, Raikkonen received an urgent radio call from the team, telling him to stop the car. Despite an attempt to roll back down the pitlane, the Finn was forced to retire from what had been a good afternoon on track. After the chequered flag, Scuderia Ferrari were fined €5000 for the unsafe release, but the real penalty came in the form of lost points from what looked like being a strong finish for the Finn.